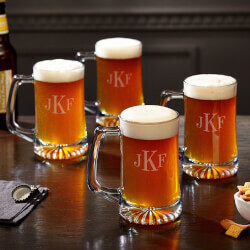 "Brewmaster 15 oz Classic Monogram Beer Mugs, Set of 4"
"Because we decided to put a classic monogram onto these etched beer mugs, now any beer lover can afford classic style at a great price. These small beer mugs still hold a full 15 ounces, for use when serving craft beer from bottles or cans. We will engrave any three initials you like on the said, ready to create the perfect birthday or housewarming gift for any beer lover. Brewmaster style mugs, arriving in a set of 4, also include our signature sunburst detailing in the base, so they pair well with our larger 25 oz steins. Each unique mug measures 5.5 tall with a 3 inches diameter and can be cleaned in the dishwasher for a lifetime of good use.Made of glass with sturdy handle and detailed basePersonalized with three initials of your choiceEach glass beer mug measures 5.5"" x 3"" & holds 15 oz.Dishwasher safe"